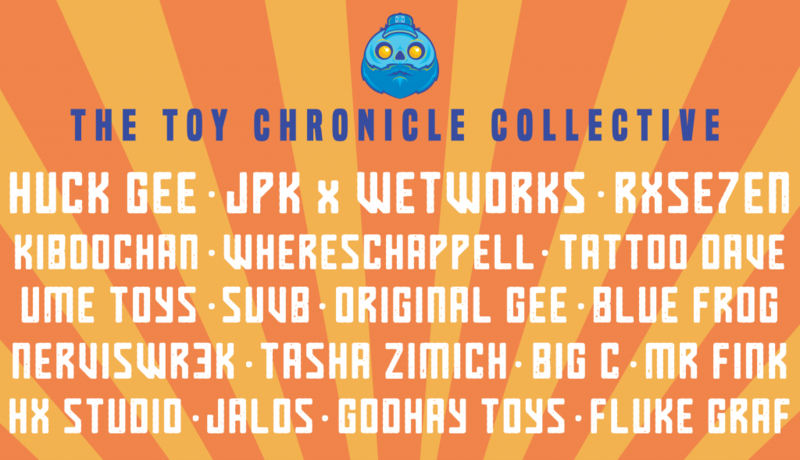 With less than two weeks to go until ToyConUK 2016 opens it’s doors at York Hall (Bethnal Green, London), The Toy Chronicle are very proud to announce The Toy Chronicle Collective! We’ve brought together an awesome line-up of artists & their work to showcase to you guys on Saturday 9th April! Over the course of the next two weeks, we’ll bring you more information on the releases you can expect to find & purchase at ToyConUK! With the likes of Huck Gee, JPK x Wetworks, RXSE7EN, Kiboochan, Whereschappell, Tattoo Dave, UME Toys, SUVB, Original Gee, Blue Frog, NervisWr3k, Tasha Zimich, Big C, Mr Fink Limited, HX Studio, JALOS, Godhay Toys and Fluke Graf – you are definitely going to be in for a treat. There are some awesome exclusives coming your way! Bring your £££, bring your smiles, bring yo self! Saturday 9th April 2016. It’s going down!